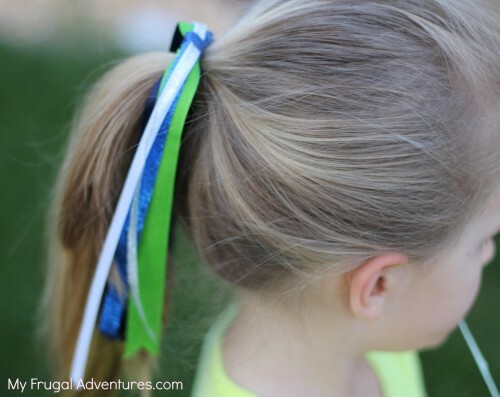 I know many of you might have little girls involved in various sports or dance or cheer and I wanted to post how to make these cute little hair ribbons. My 6 year old is back in soccer this fall, which is so much fun and a highlight of the weekend. I wanted to make some cute little hair bows for her to wear in her games and these little ribbons are very easy to put together. You can adjust the colors and patterns to suit just about any activity. Those of you that like to watch professional teams or that are tailgaters can make these too and they would be so adorable. Planning a trip to Disney? Little red and black and white ribbon would be perfect and there are all sorts of Mickey and Minnie ribbons out there. These are officially called “Pony-o” ribbons and they typically run about $5 each if you spot them at street fairs or on Etsy. They are really easy to make though and pretty inexpensive. 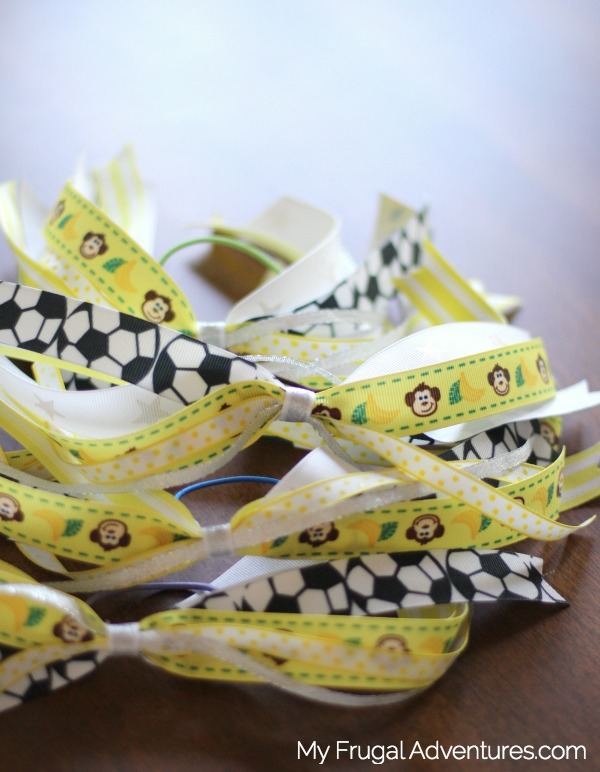 We have had a few soccer teams and I try to get ribbon to match. The yellow and black above was for the Bumblebees and the yellow and black below is for the Funky Monkeys. To start you want to lay out your ribbon and cut it to the length you prefer- typically 12 inches to 24 inches. This will depend on the length of your child’s hair. My little girl has shoulder length hair so I cut it at 12 inches. It will hang 6 inches on each side which is about right. 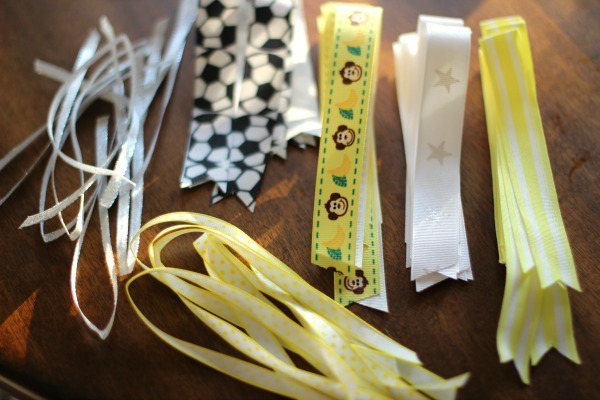 Next you want to lay out the ribbon in a criss cross pattern or you can lay the ribbons on top of each starting with the largest. I prefer to do them at an angle as pictured because you can better see all the different ribbon patterns. Whatever look you prefer is going to be great! I kept the ribbon fairly close together on my criss cross but if you want it bigger just make a larger X with your ribbons. 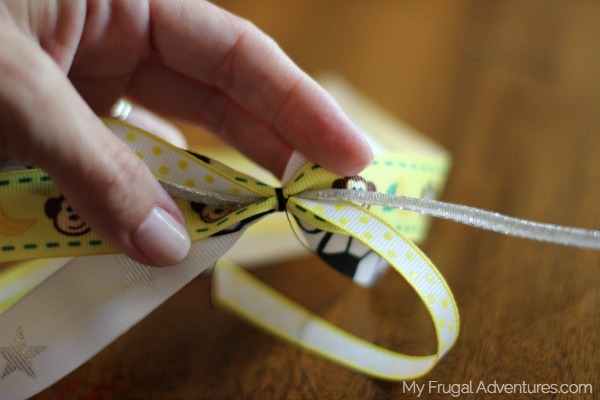 I like to use just a dab of hot glue on the center of each ribbon as I am stacking them to keep it all nicely in place and make it easier to handle. After that I use the needle and thread and push through all of the ribbon at the centerpoint. Now wrap the thread around a bunch of times. This keeps the bow secure during games so wrap and wrap and wrap and wrap. Once that feels pretty stable, use the needle to push the hair band through the ribbons and again wrap and wrap and wrap the thread around until the rubberband feels super secure. 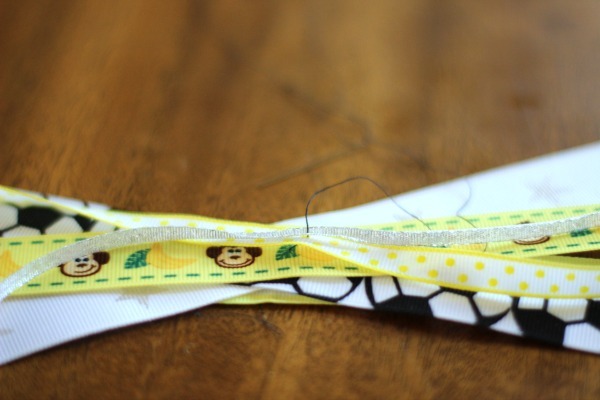 Now take a thin strip of ribbon- about 2 inches long and hot glue it around the thread to finish it off. 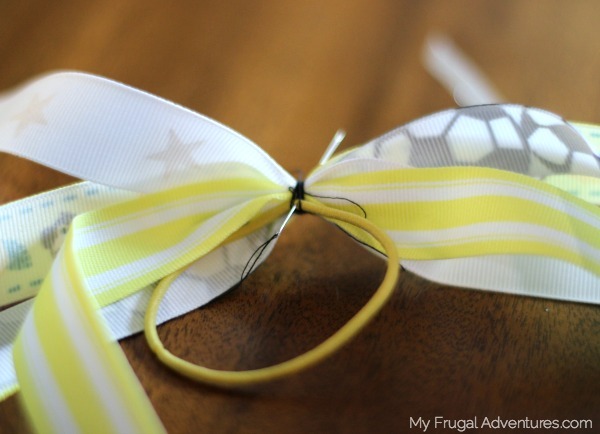 I found cute little soccer ball buttons as Joann’s crafts so for some I tied the ribbon around and for another I hot glued the button to the top. Two more steps and you are done. Either cut the ribbon tips in a V or at any angle to give it a more polished look. I like to mix and match the cuts with my ribbons. And the very last step is to seal the ribbon so it doesn’t get little stray threads. I take a lighter and hold it about 1/2 inch from the ends of the ribbon. That will seal it from fraying. You don’t want to burn the ribbon- so the flame won’t actually touch the ribbon just kind of kiss it :). If you don’t have a lighter on hand you can just leave it or dab a bit of clear nail polish or mod podge on the ends- just a little! Cute right? And so easy! I bought a few spools of ribbon on sale and with coupons and such so I probably paid about $1-2 each. 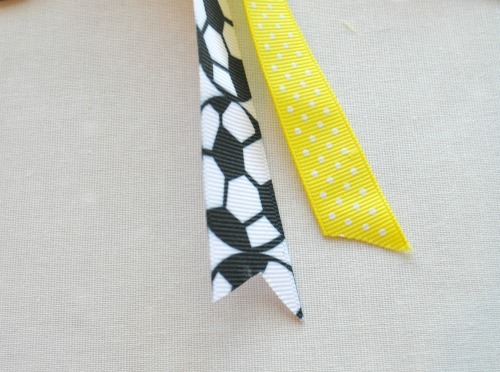 The little soccer ribbon was sold out at my local craft stores but I did find it for $3 at Walmart. So for about $10 you can make several of these little Pony Os. This would be a cute project for the girls to do together too. Here is another one that I made for Superbowl (we are Seahawks fans) and happily the colors also work for my preschoolers school colors. 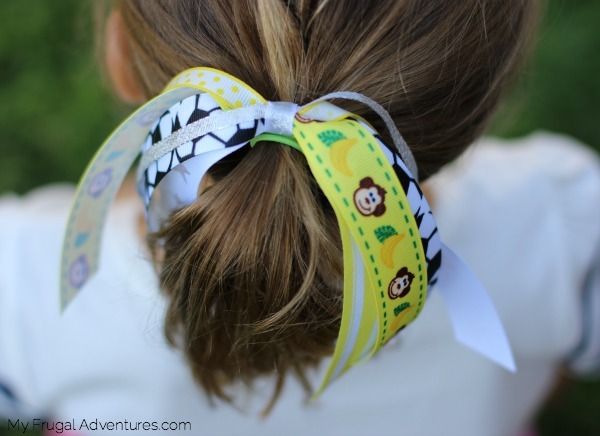 They have school spirit days where the kids wear school shirts and these little ribbons look so cute. 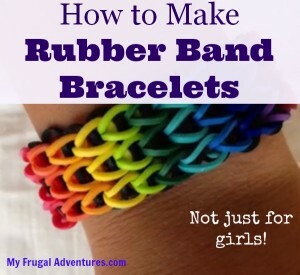 And if you do have little girls, have you checked out these adorable little Rubber Band Bracelets they can make? My six year old has made a bunch of these. Great idea Tatyana! We have to wear our school shirts once a week so this would be perfect 🙂 Great for field trips too! On top, is the soccer ball a bead, button or jewel? Where did you get it? 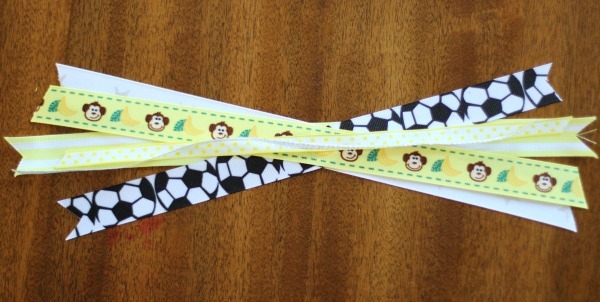 Cute ribbons! Cathy, the soccer ball is a button. I got it at Joann’s. What width of ribbon did you use? Thank you so much! Thank you for sharing this with great pics for those of us who are not-so-crafty! 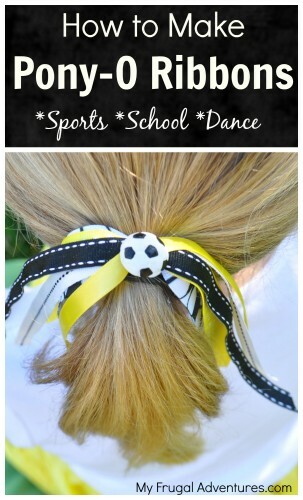 I successfully made this for my soccer girl (even with a couple of ribbons I curled myself in the oven!) and I’m soooo pleased! She’ll have ponytail streamers for any appropriate occasion from now on! Thank you! !